It’s only a week until Easter and besides the bunnies, eggs also come to mind at this time of year. 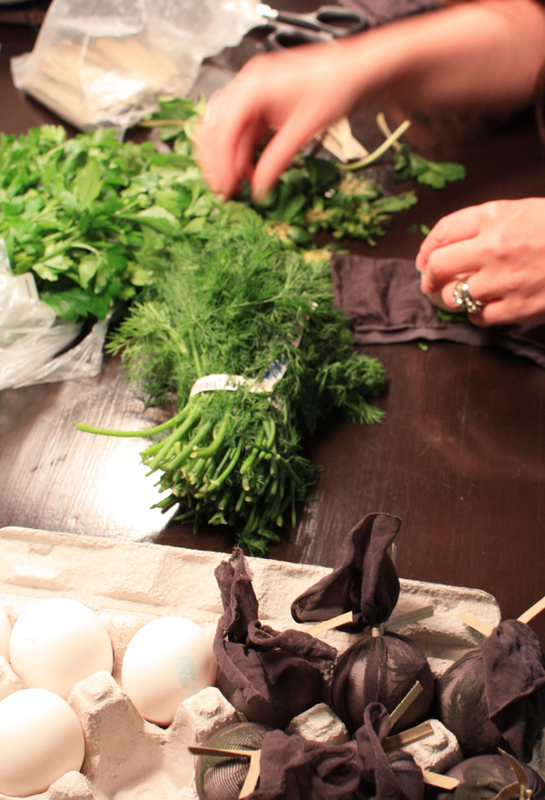 Eggs, the best symbol for potential life and growing things. They are used the world over for a fantastic pop of protein and as a comfort food. We’ve actually covered my topic of choice today a couple of times (Not Your Regular Egg Dyeing Kit and Decorating Easter Eggs: Hard Mode) but the various designs and craftsmanship still continue to capture my imagination. 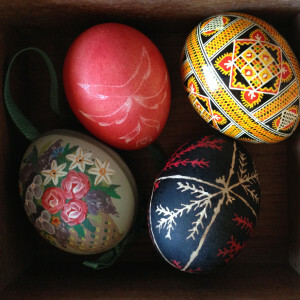 The topic I am referring to is pysanky, the Ukrainian or Polish method of using wax to create amazing designs on eggs. Just look at all the intricate designs! This ancient and beautiful tradition has continued through the ages via the hands of some very talented artists. Their patience, dedication, and vision have created some truly inspiring décor. This particular design by artist So Jeo is so gorgeous! It’s also for sale in their Etsy shop. 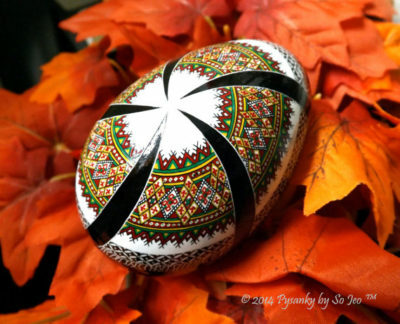 In case you were wondering, yes, there are plenty of sites out there with more information on the history of pysanky, Etsy shops filled with absolutely amazing designs, and even a few with instructions on how to effectively make your own (the two I like best can be found here and here). Plus, imagine the geeky designs to be incorporated. One ring eggs, maybe? Whichever you choose (bought or made), I hope you enjoy the journey into these stunning examples and it inspires you to further artistic heights – I know it has for me! 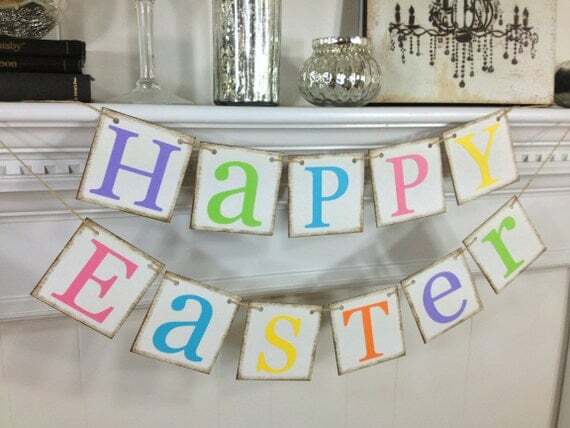 Growing up in Canada, April has always been the month of fantastic chocolate that goes on sale quickly, pastel colours on everything, and of course, dying eggs. 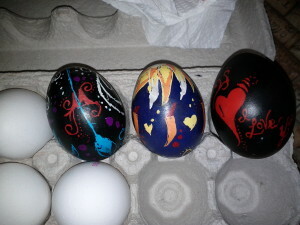 I have dyed eggs almost every year since I was a young lass. I stopped when I moved out on my own and would only really end up with a bunch of eggs that I didn’t know what to do with. Anytime I’m with family for a couple of days over the holidays, or thinking of something fun to do with friends around this time….. the eggs become involved. If you have dyed eggs before, you probably remember getting excited by the colours that the little pucks of dye turn in the water and vinegar. The thrill of dipping your virgin white egg into a bowl of colour. I might be exaggerating a little, but it was always fun to try and make the most interesting colours and combination of colours to accent your designs in wax crayon. It was like working with watercolours with blending to make new colours and everything light and soft and covered in pastel colours. Of course, as we all know, things are done in different ways all across the globe. In the Ukraine, there is a very interesting twist to this similar tradition. 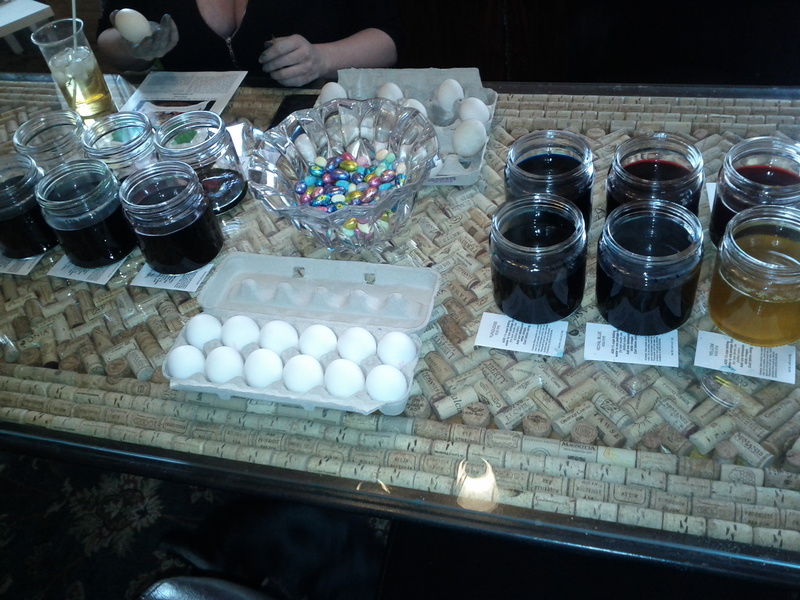 I was invited to my friends house to do some egg dying. She had been talking about dying these eggs for weeks. I love egg dying as much as the next girl, but I couldn’t really understand why she was so excited. She was telling me about these special egg decorating kits that she had to search for online as the craft store she used to get them at doesn’t sell them anymore. You can buy them for about 35 dollars depending on if you can find them locally or not. Like a mad scientist walking into an outfitted lab…. This was a whole process that really should have spanned over a couple of days and I could definately envision ladies sitting down to put together these little treasures. The first big difference is in the eggs. These kits advise you to use large goose eggs that can handle the teeny tiny designs that are involved. We used both regular and goose eggs. Another big difference is that these eggs need to be room temperature so that condensation doesn’t happen as it warms up. The third difference is that these eggs are not hard boiled, but raw so that the insides will dry up and you can just display them. Another thing that is a little different is that the instructions instructed us to draw our patterns onto the egg in pencil first. Traditional patters are very geometric and quite lovely. Eggs not made by me, but by a professional! 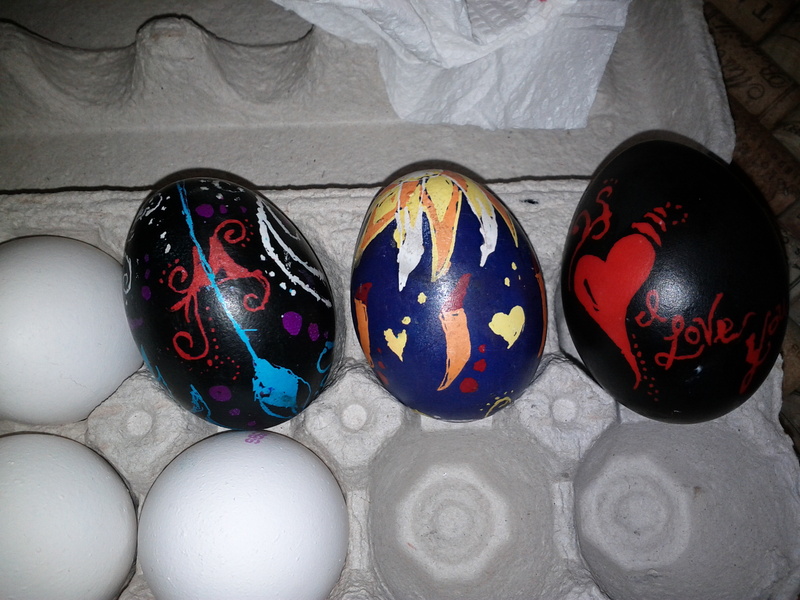 I scoffed at these patterns as I decided that my first egg should be done freehand. So skipped the pencil and went right to the kitski – of which we had 3 different sizes (that looked like the blue one pictured below). The drawing tool used to put melted wax on Ukranian eggs. They work like fountain pens where you fill this little metal cup with wax which you need to melt in a candle to get flowing. 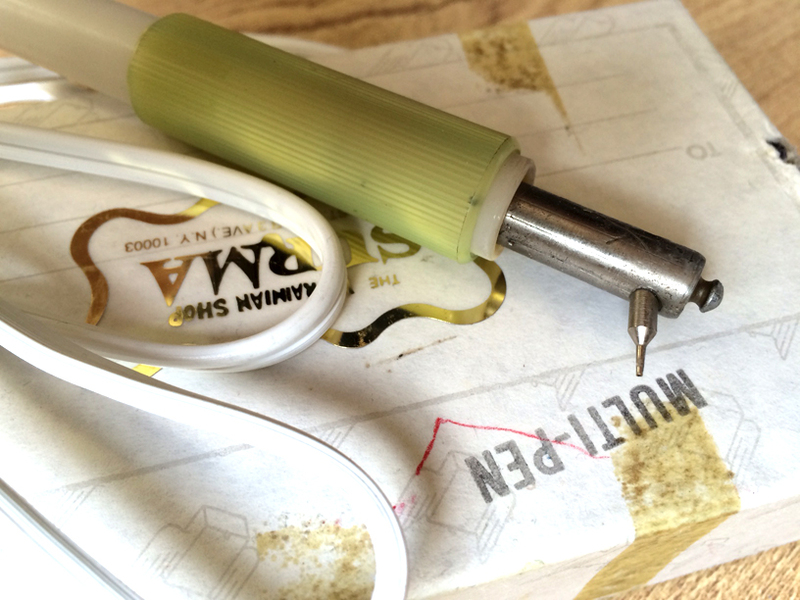 The wax flow is precise and delicate lines. The hardest part was to trust that it was writing when you couldn’t really see it, which is the most time consuming and frustrating mistake we made as so long as when blotted on a paper towel it left a little spot of melted wax, then you were good to go. The thicker wax made everything harder to clean up later. After the first layer of wax is applied you can dunk the egg into the first colour. All of the initial design ends up being white. After the first wax and dip. Not my egg, but one a little bit nicer. With Ukranian egg dying, as with regular egg dying, you should start with the lightest colour and move through to the darkest, selecting 5 or 6 that you’d like to use. After the first colour is applied you can take the kitski again and continue the design or add accents. These accents are preserved in the colour the wax was melted over. Anything added to the egg above would be orange, for example. This continues as many times as you’d like. The cool thing about these dyes that is different from what I am used to, is that they thoroughly dye over the colour before, like paint. These colours are bold and bright and amazing. It’s like comparing the watercolour of the Canadian eggs to acrylic. They are not quite the geometric designs of the traditional eggs, but it does really give you an idea of how bright and amazing the colours are. This is not my egg. But it gives you an idea of what my second set looked like. 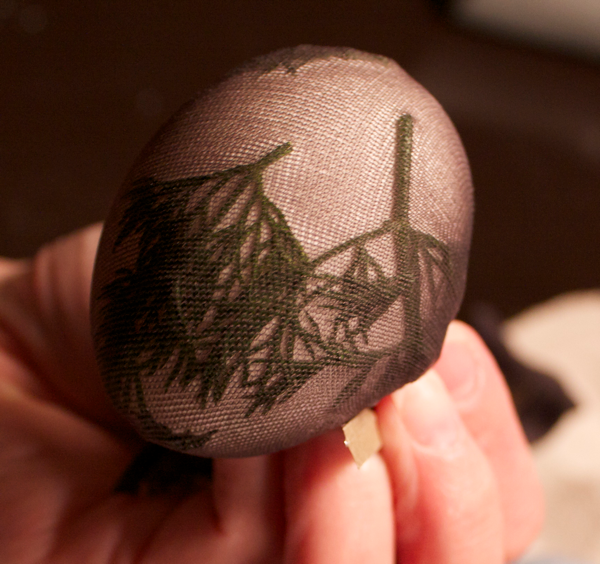 Take a close look at the egg as she removes the wax… the designs we got to after experimenting were not half bad! 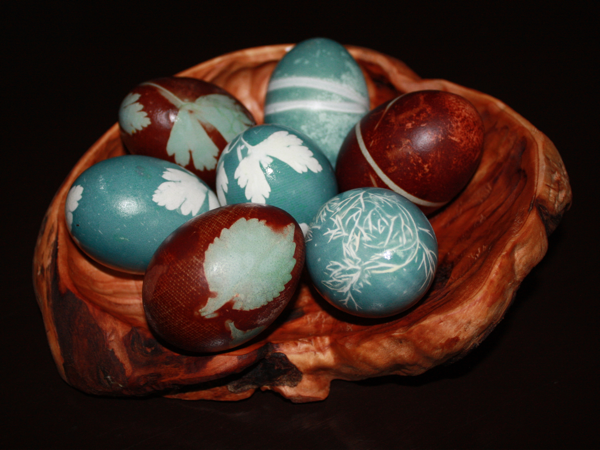 Traditionally, these types of eggs are given as gifts to bring prosperity and good luck. There are different symbols that can be incorporated into these designs to bring good luck, money or any number of good things to the recipient. 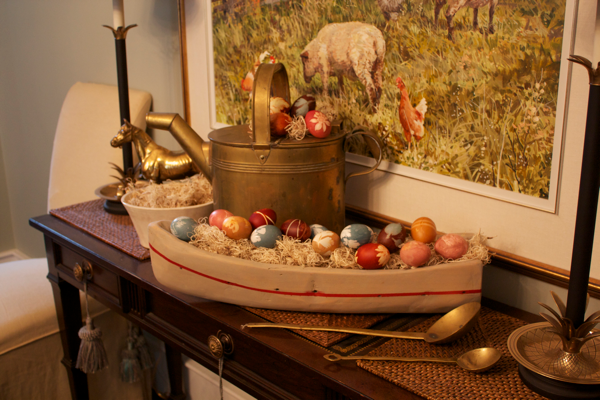 These eggs are meant to be given as gifts and to be displayed out of sunlight to avoid fading. No egg wars for these puppies! I had a lot of fun and if you have the time and the patience, it’s really impressive and rewarding when you uncover your work. I don’t recommend them for anyone very young as it’s quite delicate work, but I could have spent a weekend putting these together and watching my favourite movies. And something about a zombie coming back? I dunno….holidays are weird. In case the sugar doesn’t hold you over for today though, here are some great crafts you can do with your friends/loved ones while waiting for that delicious honey ham to finish cooking. Growing up I was blessed with a mother who liked to craft. She also has a passion for all things “folk” from folk dancing to folk music to traditional crafts. I’m not talking Joan Baez, I’m talking the various small villages that populate the world that have over the centuries created their own traditions and arts. 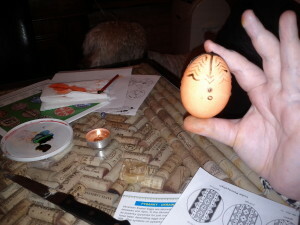 I got a package from her this year, reminding me of one of my favorite of these crafts- pysanky. Pysanky is a Ukrainian and Polish technique for dying Easter eggs, and when you’re done, you have elaborate, beautiful creations that look unlike any other type of egg decorating. 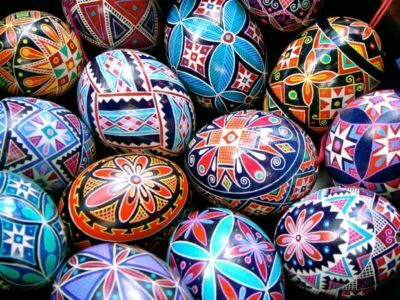 In order to get the beautiful designs so traditional to pysanky, a tool called a kistka is used to layer wax over a clean egg’s surface. 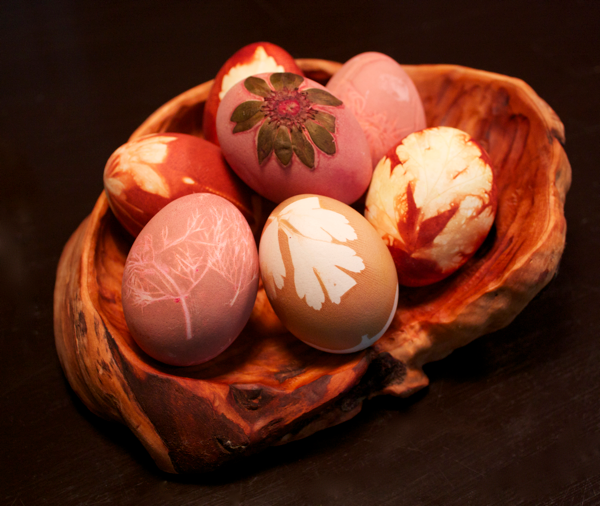 You then gently dye the egg in your first color. 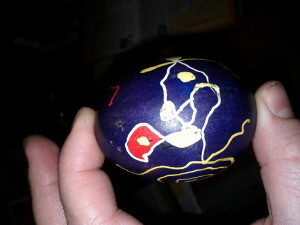 Another layer of wax is added, and the egg is dyed in a second color and so on until all the design is covered in dye. The final dye job will be your darkest color. At the end of it all, the wax is melted off the egg to reveal a parade of colors making up your design. My kistka is electric, but you can get ones that aren’t. Having spent years working this, I can tell you that it is not as easy as it sounds. The wax will slip, resulting a section becoming the wrong color and making those clean straight lines is not easy with wax that is prone to drip. 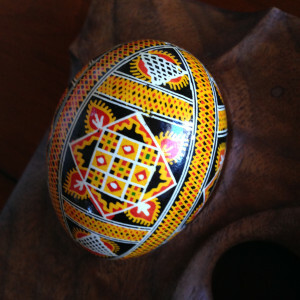 Pysanky has always challenged me to think differently about my projects- particularly how and when colours get used. It usually feels like I’m working backwards when I do pysanky as you should always start with the lightest colors first, dying from light to dark. 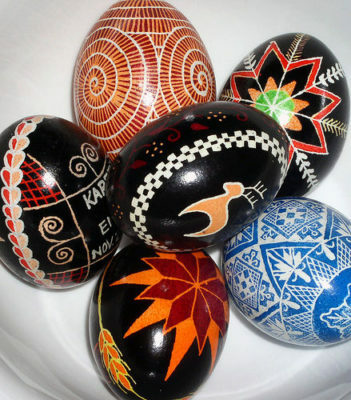 Traditional pysanky uses primarily geometric designs and is the classic type you’ll see on the right in the above picture, however more modern approaches can be taken as well. Its impressive the range of finished eggs you can get using this technique. Be warned, though. 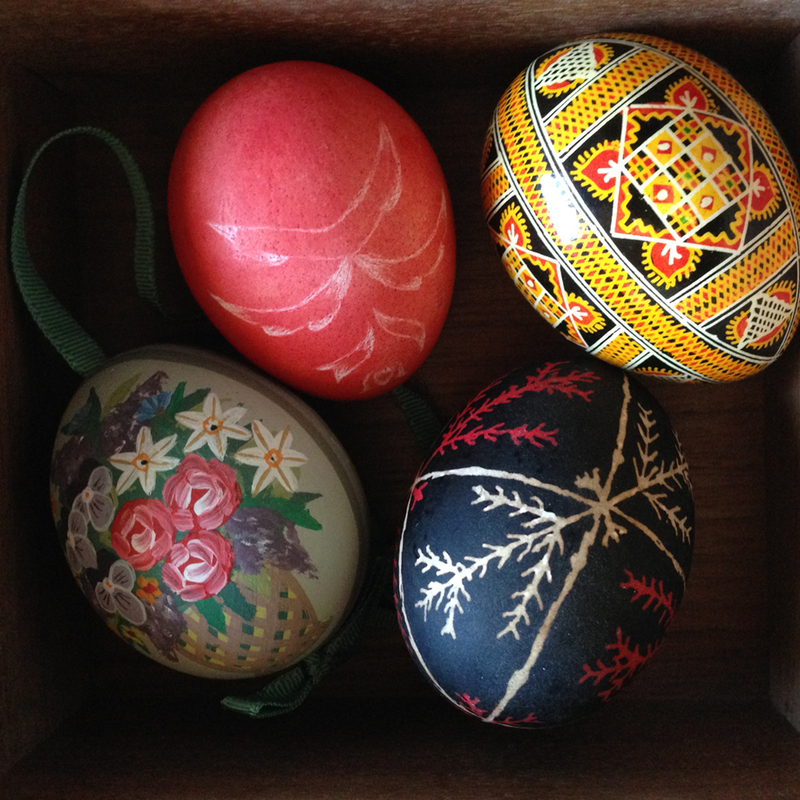 The dyes used in pysanky are much more prone to staining and your decorated eggs will be inedible due to the dyes. However, the results are beautiful enough that its worth it.